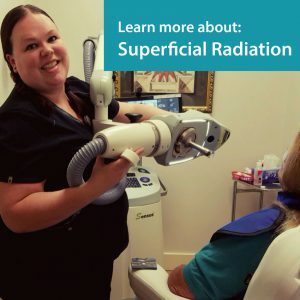 Superficial radiation therapy, or SRT, is a method of treating non-melanoma skin cancers with radiation beams or “x-rays”. 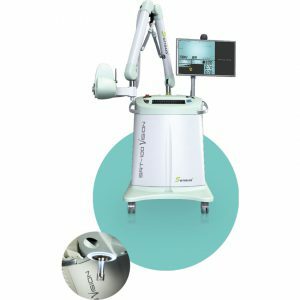 Radiation has been used for over a hundred years for skin cancers but superficial radiation therapy is a newer advanced technology for skin cancers without damage to underlying structures. SRT provides a safe, highly effective non-surgical alternative for the treatment of skin cancer without pain or scarring. The cost depends on individual insurance plans. A certified radiation therapist delivers these treatments under the supervision and regular checks by the physician. Jamie Gonzalez BSRT(T) is a licensed radiation therapist and is offering Superficial Radiation Therapy to our skin cancer patients as an alternative to surgery. Jamie graduated from Armstrong Atlantic State University as president of her class and went on to work at the Medical University of South Carolina in Charleston, SC for 5 years, where she treated a variety of cancers in adults and children. She then practiced radiation therapy in Charlotte, NC at Carolinas Health Care System. 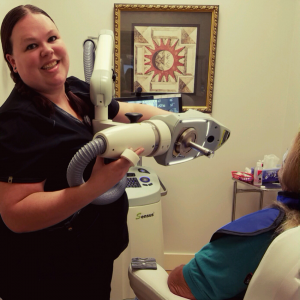 Jamie is excited to share her experience and knowledge, as well as the innovative option of Superficial Radiation Therapy in partnership with Dr. Gaughf and the Gaughf Dermatology Team.